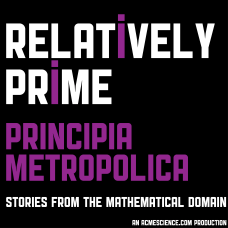 Aperiodipal numero uno Samuel Hansen’s acclaimed podcast series Relatively Prime is back, on a new monthly schedule, with an episode about how PhD student Ibrahim Sharif designed a lottery to award licences to sell cannabis in the state of Washington. When the stakes are so high (geddit?! – Ed.) you have to be really sure that your lottery is fair. That’s where a lot of fun maths comes in. 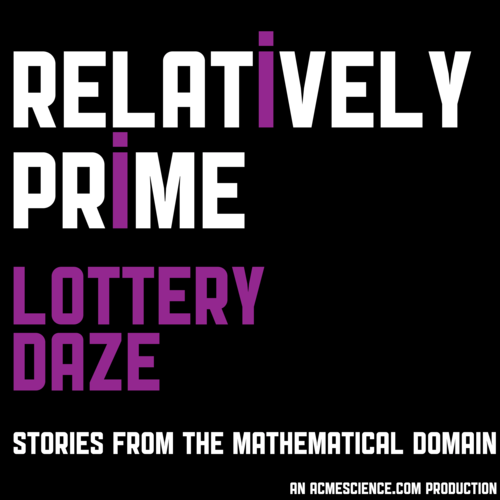 You can listen to Lottery Daze on relprime.com. 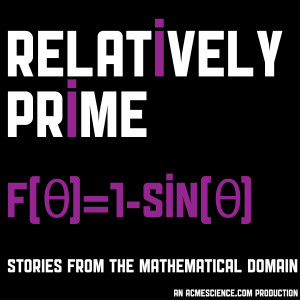 Sam intends to fund this new incarnation of Relatively Prime through Patreon – you can pledge to pay Sam a certain amount (starting at a dollar) for every episode he releases, with perks for paying more such as a postcard from Sam or placing an ad in one of the episodes. There really isn’t enough silliness in maths. Samuel has tried to inject some throughout the series, sometimes more successfully than others. This is the episode where he finally nails the silliness. Diegetic Plots, Chapter 2 is a nice finale to a generally good season of Relatively Prime. Dealing with sketches and haiku from the mathematical domain, we get a glimpse of the daft side of maths. I’d have written it as $r = 1 – \theta$, myself, but even then it’s not much of a heart. 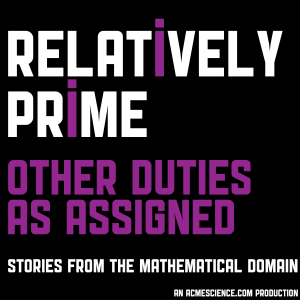 However, that’s pretty much my biggest gripe about this episode, the penultimate in series 2 of Samuel Hansen’s one-of-a-kind mathematics podcast, Relatively Prime. Episode 7 is subtitled “Dating in the mathematical domain”, and looks at the maths involved in dating and relationships, and begins with some of the comments Sam’s dating profile received from non-mathematicians. Now, denizens of the dating world: Samuel has many flaws and failings; picking on the fact that he’s a mathematician seems a little arbitrary and unfair, like deciding not to vote for Donald Trump because you don’t like his tie. I have this unfamiliar sensation. Could it be… surely not? It appears that I feel a little sorry for Samuel. Don’t tell him, ok? I’ve been looking forward to this one: cities in the mathematical domain. This is the kind of applied maths I can really get behind. Samuel starts with Mike Batty of University College, London’s Centre for Advanced Spatial Analysis discussing how cities grow and organise themselves. The structure is frequently fractal; how does one calculate the dimension of a city? From a top-level view of cities, he moves on to a low-level description of one of the biggest problem in cities: traffic (another thing that fascinates me). We get a glimpse of traffic waves, and the unfairness that the person responsible for the average jam doesn’t suffer from the effects. And we learn that Gábor Orosz (University of Michigan) tests his hypotheses using robots as well as simulations. On top of the usual disclosures, I should add that Dave Gale and I interviewed Samuel Hansen this week for our Wrong, But Useful podcast, which you might like to listen to for a deeper insight into Samuel’s brain. During the conversation, he warned me I wouldn’t like Episode 4 of the new Relatively Prime, “Diegetic Plots, Chapter 1”. I don’t know if that was expectation management or an elaborate double bluff, but the joke’s on you, Hansen: I jolly well did like it, so there!